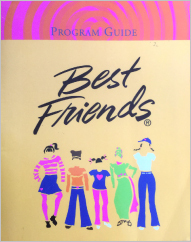 Best Friends is a school based character education program for girls that begins in the sixth grade and continues until high school graduation. Best Friends provides a developmentally sound curriculum in an educational setting which promotes fun, companionship, and caring. When Best Friends girls reach ninth grade, they enter the Diamond Girl Leadership pro-gram which is designed to keep girls interested, involved, and committed to their character education through high school. Our goal is for all Diamond Girls to graduate from high school with specific college, vocational, or career plans. Best Friends provides a character-building curriculum, an intensive peer support structure, and long-term adult involvement. Best Friends is a school-based character education program for girls that begins in the fifth grade and continues through high school graduation. It provides a developmentally sound curriculum that promotes fun, companionship, and caring leading to graduation from high school with specific college, vocational, or career plans. Group Discussion Girls discuss and receive guidance on the topics of friendship, love and dating, self-respect, decision-making, alcohol abuse, drug abuse, physical fitness and nutrition, AIDS and STDs. Group discussion sessions are conducted during the school day at least once a month. Role Model Presentation At least twice a year distinguished women from the community meet with the girls to discuss their own lives and families and the important decisions they made when they were young. Mentor Meetings Each Best Friends girl has a mentor, a member of her school faculty, who meets with her for 30 to 45 minutes each week. Girls select their own men-tors from a list of teachers who have agreed to participate. Fitness and Nutrition Classes Best Friends girls participate in a weekly fitness/dance class. Community Service Girls are required to participate in at least one community service project each year such as Race for the Cure, clothing drives to benefit the homeless, adopting a community day care center, and reading to children. Stop the Silence, Prevent the Violence An on-site assembly or fully day seminar which educates students to prevent bullying, relationship violence, and substance abuse designed for elementary, middle school, and high school. Cultural Enrichment Activities We provide opportunities for the girls to attend uplifting cultural events, including theater and dance performances, concerts, and exhibits. Annual Family and School Recognition Ceremony At the end of the school year, the Best Friends girls, Diamond Girls, mentors, and parents are honored. The ceremony is held to showcase the Best Friends girls and Diamond Girls and their commitment to the Best Friends messages through music, dance, and public speaking. Girls are recognized by their family, school, community, and national leaders. College scholarships, awards, and prizes for outstanding essays are presented.